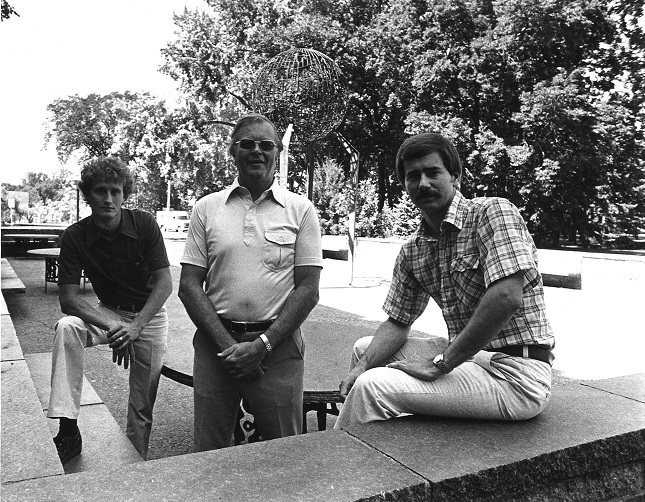 Gerald “Jerry” Hamerlik (center), poses for a photo near the Eternal Flame in 1979 with then fellow Enrollment Services employees, Ken Polovitz (now with UND Aerospace, on the left in the photo) and Dave Parker. University Relations. Gerald F. “Jerry” Hamerlik, retired dean of enrollment services, passed away on Wednesday, April 11, 2018, at Valley Eldercare in Grand Forks.He was 88. He served the University for 37 years, from 1957 to 1994. During that time he become nationally known for his expertise in the area of student financial aid and for his success in recruiting to UND many of the top graduates in the region. Working with key administrators, he created some of UND’s top scholarship opportunities. He was praised by former UND President Kendall Baker as having played a key role in easing the transformation of UND from a campus of 4,025 students to the highly complex institution of more than 12,000 at the time of his retirement. Jerry Hamerlik was born on Sept. 1, 1929, in Breckenridge, Minn., to Frank and Mary (Kadlec) Hamerlik of Brushvale, Minn. He attended a one-room school with nine classmates for his first four grades. His family moved to Wahpeton, N.D. in 1939 where he attended school at St. John’s Catholic School and Wahpeton High School. He attended the State School of Science in Wahpeton (NDSCS) for two years, earning an A.A. degree. He attended NDSU (then NDAC) and earned a B.S. degree in education. He was a member of Alpha Tau Omega fraternity and participated in track, football and basketball in high school and college. After serving honorably in the U.S. Air Force, he taught and coached in Crosby, N.D., for five years. He attended the University of North Dakota during summers, and completed his M.A. degree in 1959 and his doctorate in 1963. On August 12, 1957, he married a fellow Crosby teacher, Agnes Berg, in Williston, N.D.
Hamerlik began his association with UND in 1957, when he became assistant to the dean of men and head resident of Bek Residence Hall while working on his master’s and doctoral degrees. During the next nearly four decades he filled a variety of progressively responsible positions in UND’s student affairs division. In 1959 he became assistant to the dean of students; in 1962 associate dean of students and dean of men; and in 1965 acting dean of students and UND’s first director of financial aid. He guided UND’s response when the federal government first moved in a large scale way to assist students financially in attending college. At the time of Hamerlik’s retirement, UND President Emeritus Thomas J. Clifford had lauded him for his ability to get UND in on the ground floor as new financial aid programs were developed, and said much of UND’s early involvement in American Indian programs was made possible by Jerry’s work. During his nearly 40 years as director of financial aid, Hamerlik was responsible for dispersing $372.1 million in grants, loans and work study opportunities. In 1979, when he became dean of enrollment services (and continued as director of financial aid), Hamerlik led the consolidation of the financial aid office with several previously scattered functions that provided information and assistance to prospective and new students. Such a structure was rare at the time but became the model in higher education. Hamerlik served eight years as North Dakota’s representative on the corporate board of American College Testing (ACT) and from 1974 until 1987 he managed the U.S. Office of Education’s student financial assistance training program in North Dakota. He retired from UND on June 30, 1994, after 37 years. Hamerlik was active in his community, including Crosby Jaycees, Sioux Boosters, Grand Forks United Way, Grand Forks School Board (1969-1978), Grand Forks City Council (1994-2012), Altru Hospital Board (1976-1992) and the Union Lake Improvement District, among others. He was appointed twice by Gov. Art Link to the North Dakota Teachers Professional Practices Commission. 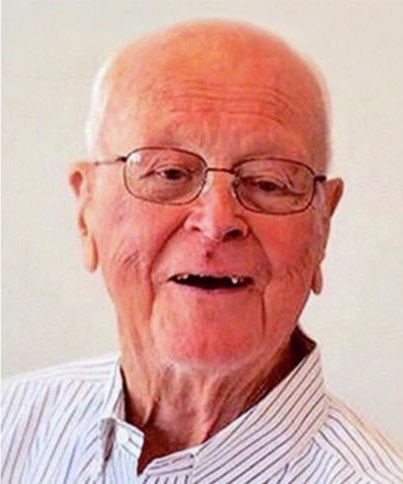 He was a member of St. Michael’s Catholic Church for over 55 years, and was active in many church organizations, including the Men’s Club and St. Mike’s Park Board Committee. He was a continuous member of the Knights of Columbus from 1947 until his passing. Survivors include his wife of over 60 years, Agnes, children Kari (Paul) Kolstoe, Mike (Beth) Hamerlik, and Maria (Scott) Hennen; grandchildren Liz (Brad) Mackowick, Laura (Travis) Vaughn, Matt (Bailey) Krusen, Anna Hamerlik, Alex Manz, Hannah Manz, and Haley Hennen; great-grandchildren Alyssa Mackowick, Joshua, Jacob and Ella Vaughn, and soon, Baby Girl Krusen; nephew Jim (Jeri) Holmes and their daughter Jennifer, and niece Roxanne Holmes and her daughter Mariko (Marcus) Fairly; and many nieces and nephews through marriage. He was preceded in death by his parents and only sibling, Elayne Holmes Wade.